The circuit courts established by the Earl of Caledon in 1811 introduced the fundamental features characteristic of proceedings at common law to the Cape and thus constitute an important precursor to the Charters of Justice of 1827 and 1832. They also paved the way for the circuit courts established in 1827 under the First Charter of Justice, the predecessors of the circuit courts which to this day form part of the legal landscape in South Africa. 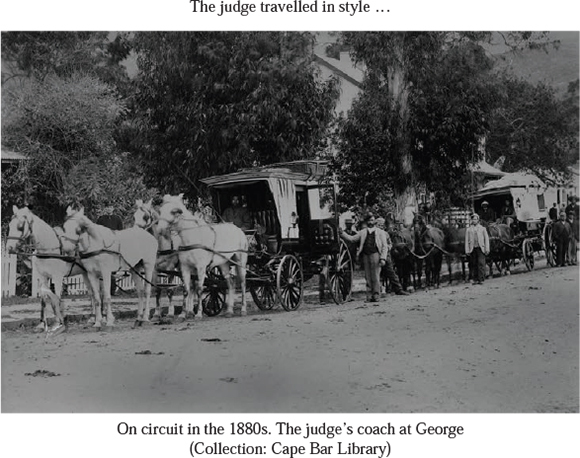 During the nineteenth century, judges of the Cape Supreme Court regularly visited outlying towns and districts to hear both civil and criminal cases. The circuits lasted for weeks and long distances were travelled under primitive and hazardous conditions. The judges and counsel often had to endure great physical hardship. They all stuck to their task with commendable tenacity and perseverance. In the circumstances, the contribution of the Cape judges to the development of South African law and to the survival of the Roman-Dutch law was a remarkable achievement. The circuit courts brought to the outlying districts the administration of justice at the highest level. The sittings of the courts were open to the public, and the community participated in the proceedings by way of jury service. All this contributed to the integration of the administration of justice into the social fabric and "judicial conscience" of the people in the outlying communities. The circuit courts played a major role in entrenching the English procedural and judicial style in the minds of the people, and in bringing home the message that the courts were open to all the people of the colony, and that the protection of the courts extended to all of them. Es ist nicht leicht, sich heute von den Rahmensbedingungen der Rechtspflege in der damalige Zeit eine Vorstellung zu machen. Die über die weiten Entfernungen des Westkap führenden, bei Wind und Wetter in zweispännigen "Cape cart" zu absolvierenden "circuits" waren mit grossen Strapazen verbundet. (Reinhard Zimmermann "Die Rechtsprechung des Supreme Court of the Cape of Good Hope am Ende der sechziger Jahre des 19. Jahrhunderts" in J van der Westhuizen et al (eds) Huldigingsbundel Paul van Warmelo (Pretoria, 1984) 286-307 at 290-291. The term "circuit court" is here used to denote the practice of having judges of Superior Courts travel around the country from one venue to another to hear cases away from the permanent (principal) seat of the court.1 Circuit courts originated in England and were subsequently adopted and developed in former British colonies to deal with the problem of distance and isolation from the principal seats of Supreme or High Courts. Two notable examples are the United States and South Africa. In South Africa, despite hazards and hardships and complaints in the early years, circuit courts to this day form part of the legal landscape. This essay focuses on the formative years of the circuit courts at the Colony of the Cape of Good Hope during the period 1811 to 1900. An attempt will be made to evaluate the performance, achievement and impact of the circuit courts from a perspective somewhat wider than the strictly legal or legal-historical. The objective is not to produce a "new" history of the circuit courts, but having regard to the conditions under which they operated, to evaluate their achievement and their influence on the development of the administration of justice in South Africa. By way of introduction, Sir George Yonge's abortive 1801 proposal for the introduction of circuit courts will be briefly described. Any complaint, however trivial, and all matters touching the morality and good Government of the Country Districts, shall be noticed by the Commission and reported to the Governor, and such steps may be taken as he may deem meet. The provisions of regulation 21 were of crucial importance, both to the conduct of the proceedings of the circuit court at that time, and in the long term to the future administration ofjustice in South Africa. The regulation provides that "[a]ll examinations, in cases upon which a decision is to be given, shall be held in open court". The manner in which the circuit courts were conducted elicited high praise at the time. In its report to the Earl of Bathurst the Commission of Enquiry under JT Bigge and WM Colebrooke on courts ofjustice at the Cape,33 lauded as a "salutory" improvement the Earl of Caledon's institution of circuit courts in 1811 because, despite certain shortcomings in the administration of the courts, "some degree of relief has been afforded to the Inhabitants of the distant Districts from the expense of bringing their Actions before the Court at Cape Town".34 The salutary influence of the work of the commissioners on circuit was not confined to their legal work. The regular reports which they submitted in fulfilment of their obligations under regulation 62 played a vital role in the general improvement of government. The use of the English Language is required by the Charter in the Supreme Court, nor does there seem any reason longer to postpone the adoption of a measure which has been so long in contemplation. But in the circuit courts, it may, perhaps, be necessary for the present to continue the use of the Dutch Language. One of which shall contain the Subdistrict of Clanwilliam and the Districts of Worcester and Stellenbosch; the other shall contain the Districts of Swellendam and George; and the third shall contain the Districts of Uitenhage, Albany, Somerset and Graaff-Reinet and the Subdistrict of Beaufort. Western circuit: Clanwilliam 1 May; Worcester 7 May; Stellenbosch 26 May. Midland circuit: Swellendam 1 May; George 7 May. Eastern circuit: Uitenhage 1 May; Graham's Town 8 May; Somerset 23 May; Graaff-Reinet 27 May; Beaufort 6 June. 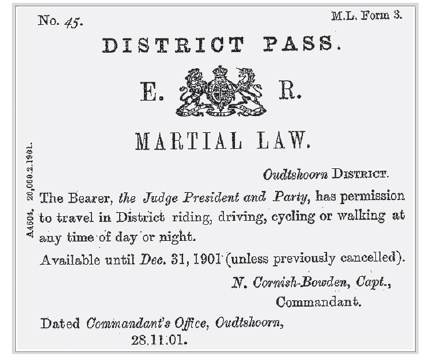 The midland circuit was uneventful and Judge Kekewich "professed himself gratified by the sanity of the verdicts [of the juries] at George and Swellendam".54 The western circuit was marred by Judge Menzies' rejection of a number of persons who had been summoned as jurors, on the ground that they were not sufficiently proficient in English. This gave rise to a conflict of opinion among the judges - a topic to which I shall return shortly. The practice of having more than one circuit simultaneously did not continue.57 Indeed, in his letter of 5 April 182758 to Major-General Bourke at the Cape, Viscount Goderich, the Secretary for Colonies, stated that "it does not ... seem desirable that any Judge should be required to perform more than two journeys in any one year. No two Circuits must be held at the same time, because it is not proposed to withdraw two Judges at the same time from Cape Town". Stellenbosch 3 October; Clan William 8 October; Worcester 18 October; Beaufort 25 October; Graaff-Reinet 30 October; Somerset 5 November; Graham's Town 11 November; Uitenhage 19 November; George 27 November, Swellendam 1 December. The full circuit was undertaken by Judge Menzies - his account of his experiences on that circuit is considered below. Stellenbosch 5 October; Worcester 8 October; Beaufort 16 October; Graaff-Reinet 20 October; Somerset 26 October; Graham's Town 31 October; Uitenhage 11 November; George 21 November; Swellendam 26 November. It will be observed that the two circuits mentioned above each lasted two months; the second circuit of 1830 lasted three months, from 1 September to 6 December. If the second circuit of 1829 were to be undertaken by car today along the main roads linking the various towns, it would entail a trip of more than 1600 kilometres on good roads. Judge Burton took the second circuit of 1829. He reached Grahamstown on 31 October 1829. From there he wrote a long letter to his brother Menzies in Cape Town. I was able to accomplish it in nine weeks, only by continuing the sittings of the court, at the different towns, frequently till eleven and twelve o'clock at night, and some times till the morning of the following day, and by riding at the rate of between sixty and seventy miles a day, for several days successively, and, on one occasion riding eighty four miles, and, on another, one hundred and thirty miles in one day. I was sometimes under the necessity of causing the waggons, which conveyed the circuit clerk and my baggage, to travel all night in order that it might be able to reach the circuit town in proper time. During the nine weeks of my absence from home, I can safely say that, at a very moderate average, I was either on the bench or on horseback, for ten hours a day ... During the journey, I was often compelled to sleep in the waggon; and, except, while actually in the circuit towns, I was invariably obliged to lodge in the houses of the Boers, whose circumstances, accommodation and habits of life rendered my residence in their houses, during so long a period, very uncomfortable and irksome. From the experience I have acquired, during the last circuit, I feel myself warranted in stating that 'due regard to the health and proper comfort of the judge on circuit' requires that some alteration should be made on the present arrangements for holding the circuit courts. I have now reached my greatest distance from home but shall not consider the Circuit half performed until I leave Graham's Town next Monday morning. There is a delight in travelling homeward which perhaps made the Karroo more sufferable on my former journey than on this, but this circuit is a sad drawback upon one's happiness. To leave your wife almost alone for so long a time and yourself exposed to accident which might keep you apart for months is a hardship which ought to be summed up in our favour at the end of the case but which yet must not be expected to be at all thought of. I cannot believe that there is any colony where the Puisne Judges have so arduous a duty as the Circuit imposed upon them here and the remuneration if it end with the 1500 a year is wholly inadequate. But all this you know and feel as well as I and it is but malicious to remind you that you are yet to endure what I am enduring. There was to be an ironic twist to Judge Menzies' remark that "'due regard to the health and proper comfort of the judge on circuit' requires that some alteration should be made on the present arrangements for holding the circuit courts", and to Judge Burton's remark in his letter to Judge Menzies that the latter was "yet to endure what I am enduring". Many years later, in 1858, in his response to Sir George Grey's plan to increase the number of circuits, Chief Justice Hodges said that the deaths of Judges Menzies69 and Musgrave70 had been hastened by their labours in the appalling conditions that then prevailed on circuit. Judge Menzies was already desperately ill when he left Cape Town in September 1850 to take up the circuit. He spent his last night in Cradock at the home of The Reverend Samuel Gray whose sister Lucy, in her comprehensive correspondence about her visit to the Cape, wrote that Judge Menzies was physically a broken man who had suffered agonies during the extended circuit. "He had to be carried from the carriage to his chair" she wrote, "and lifted on to the carriage again; and he is a man whose energy and determination will carry him through almost anything. His pride goes against assistance of any sort. He could scarcely articulate a word from shortness of breath, but pretended it is asthma. He may die any moment, yet intends to proceed with his journey tomorrow".71 The next day he left for Colesberg, where he died fifteen minutes after his arrival. The roads in the Colony in the early nineteenth century were mere tracks carved by ox-wagons and horse-carts. Mountains and rivers presented formidable obstacles:77 wagons often had to be unloaded, and sometimes taken to pieces and transferred to the backs of the oxen. The difficulties and dangers of crossing mountains are well illustrated by Mitchell's graphic sketch of Cradock Kloof (predecessor of the Montagu pass).78 In 1843 when John Montagu initiated his ambitious road-building programme, the only pass in existence was Sir Lowry's pass, completed in 1836. Under Montagu's aegis,79 the hard road across the Cape Flats was built (1845), and the following passes constructed: Houwhoek (1847), Mitchell's Pass (1848), Montagu Pass (1848), Bainskloof (1853), Piekenierskloof (Grey's Pass) (1858) and Meiringspoort (1858). Later in the century there followed the construction of, among many others, the famous Swartberg Pass (1888), with the result that there was a marked improvement in conditions of travel. But, as Burman points out,80 "all these improvements had only speeded up transportation from the pace of the ox to the pace of the horse"; that is, from 2,5 miles per hour to 6 (or at best 10) miles per hour. Travel by rail was not only faster but also much more comfortable. Special railway carriages were made available to judges and their entourage on circuit, which included a chef for the preparation of meals in the special kitchen in the carriage. Such carriages were in use until at least the late 1980s. This was a significant improvement on the accommodation the judges sometimes had to endure. Accommodation on circuit varied from satisfactory to very bad.106 Judge Sampson found many of the hotels "unspeakable", but much improved in later years.107 The Government later resorted to hiring lodgings for the circuit judge at each of the various venues of the circuit. In the Government Gazette of 12 January 1854 tenders are called for the supply of lodgings for the circuit judge at the "next circuit", tenders to be submitted to the Resident Magistrate of the districts concerned. The requirements were rather modest: a furnished sitting room and two bedrooms, one servant's room, kitchen and pantry, with cooking utensils, table linen, crockery and cutlery. Fifty years later, in an advertisement dating from 1902,108 it appears that the requirements for the lodgings for judges had been considerably upgraded: what was now required was a large and well furnished dwelling house, suitable for the judge and his party which would include his registrar, valet, coachman and stable keeper, cook, butler and housekeeper. The advertisement also called for the supply of provisions: meat, vegetables, fruit, bread, milk, table wines and spirits. As indicated above, with the coming of the railways, accommodation for judges on circuit was provided in special luxury coaches. At the opening of the first criminal sessions in Cape Town on 15 May 1828 Chief Justice Wylde announced that the judges had decided that jurors would need to have a sufficient understanding of English to enable them to follow the proceedings without the aid of an interpreter. As has been pointed out above, Judge Menzies on the western circuit at Worcester followed suit and rejected a number of persons who had been summoned as jurors on the ground that they were not sufficiently proficient in English. As there were not a sufficient number of jurors available with a sufficient knowledge of English to constitute a jury, he ordered the case to be removed to Cape Town for trial. Judges Burton and Kekewich disagreed with the Chief Justice and Judge Menzies on this matter. A lengthy dispute ensued.119 Eventually the Secretary for Colonies became involved and in 1834 the issue was resolved by the Second Charter of Justice, which provided in section 34 that no person otherwise competent to serve on a jury would be disqualified by reason of his ignorance of the English language. However, Judge President Laurence puts his finger on one troublesome feature of the system when he states that "diversities of race and colour of course complicate the situation".133 This is a factor not unique to the Cape. To this day the racial element may be an important factor in jury selection in the United States of America. Within the context of prevailing attitudes at the Cape, the problem was twofold: (i) jurors were mainly, but not exclusively, white; and (ii) in certain situations racial prejudices influenced decisions. The case of Bergman and Hennik was heard first. The jury acquitted the accused, "amid the cheers of a crowded court".140 The prosecutor, Jones, suggested to Upington, the attorney general, that the second case be transferred to another venue "on the ground that party feeling in favour of the prisoners in the Koegas affair appears to be so high that it will be impossible to obtain an impartial trial in that case".141 The attorney general declined to act upon the suggestion and the second case proceeded. The evidence against the accused was not as strong as in the first case, and was further marred by Dwyer J's strange ruling that neither a verdict of murder nor one of culpable homicide was possible in the absence of clear proof of death by the identification of the remains. The shooting had taken place a year before and no such evidence was produced. As a result only Zoutaar was convicted of assault with intent to do grievous bodily harm and sentenced to five years imprisonment; the other two were acquitted. The Reverend DP Faure, the interpreter, wrote a scathing letter under the signature "Fiat justitia" to the Cape Argus. The editor, Dormer, "who wielded a powerful pen in the style rather of the bludgeon than the rapier",142 followed this up with two editorials in which he charged the attorney general with conniving at a failure of justice for political ends (at the time the attorney general was also the Minister of Justice in the Cabinet) and called upon him to rebut the charge, or resign his office. Upington's actions for defamation followed. At the trial it was recognised that the editorials were grossly defamatory, and the only issue was whether they were fair comment on the facts. De Villiers CJ, Stockenström J concurring, held that the second editorial exceeded the limits of fair comment and gave judgment for the plaintiff in both actions. In view of all the circumstances, and to mark the Court's disapproval of the institution of two actions where one would have sufficed, the damages were nominal: one shilling against Saul Solomon with no order as to costs, and £5 with costs against Dormer.143 It was, as Innes points out,144 rather a Pyrrhic victory for Upington, for the court held that his failure to act upon the suggestion of the prosecuting barrister had been a grave error of judgment. Except as part of the background, the Court was not concerned with the acquittal of Bergman and Hennink; in issue at the trial was the conduct of Upington and Dormer's fiery editorials. However, the case had wider significance: below the surface divisions simmered in Cape colonial society. The participation of the Korana in the 1878 war on the northern border was the last stance by a by now desperate people who had for many years been a thorn in the flesh of the colonists on the north-west border of the Colony.145 During the nineteenth century, three major colonial expeditions were mounted against the Korana who occupied the small islands in the Orange River between Upington and the Augrabies falls.146 Atrocities had been committed on all sides during the lengthy confrontation, the resulting hardening of attitudes toward the Korana being fed by racist prejudices on the part of colonial officials, colonists and other groups such as the Bastaards147 who all "looked upon the Korana as an uncivilized, morally degenerate and lazy people with an innate desire to steal cattle".148 During the 1878 uprising, the Korana re-occupied the islands in the river, and stole the Bastaards' cattle. They were dislodged with great difficulty from unfavourable terrain. In this context of bitter warfare the prisoners were taken and the murders committed. The Court had no hesitation in holding that the attorney general (and Minister of Justice) had committed a grave error of judgement. The Court further dissented from Dwyer J's ruling regarding the corpus delicti, and censured Dwyer J for writing an "inappropriate" letter to Saul Solomon.152 The Court also expressed strong views about the undesirability of the attorney general holding political office. Fine has compiled tables depicting the number of criminal and civil cases tried in the Supreme Court at Cape Town and in the circuit courts during the period 1854 to 1863. 1854 - 307; 1855 - 242; 1856 - 230; 1857 - 306; 1858 - 398; 1859 - 729; 1860 - 466; 1861 - 406; 1862 - 344; 1863 - 512. By way of contrast, the number of criminal cases tried in Cape Town varied from forty-three in 1854 to sixty-six in 1863, with an average of about fifty cases per year. 1854 - 443; 1855 - 578; 1856 - 521; 1857 - 280; 1858 - 258; 1859 - 348; 1860 - 324; 1861 - 287; 1862 - 485; 1863 - 573. The number of civil cases tried in Cape Town varied from 382 in 1854 to 1 286 in 1863, with an average of about 570 cases per year. The same pattern emerges from returns of cases heard after the establishment in 1864 of the Eastern Districts Court. In a Return of Cases Brought before the Supreme and Eastern District Court and the Several Circuit Courts during 1867,157 the registrar of the Supreme Court reported that during that year 388 civil cases and ninety-two criminal cases were tried in the Supreme Court, while in the circuit courts sixty-two civil cases and 386 criminal cases were tried. In a comprehensive Comparative Return158 of the number of cases heard in the Supreme Court, the Eastern Districts Court and the western and eastern circuit courts during the years 1870 to 1872, the registrar of the Eastern Districts Court appended a table of all the cases, civil and criminal, tried in the circuit courts of the Eastern Districts between 1 June 1865 and 31 December 1872: a total number of 941 civil cases and a total number of 1 743 criminal cases. A Return of Number of Cases Disposed of by the Higher Courts During the Last Three Years (ie 1891, 1892, 1893)159 shows that during the three years in question, criminal trials in the western circuit courts numbered 361, in the eastern circuit courts 1 573 and in the northern circuit courts 416. Defended civil trials numbered twenty-one in the western circuit courts, thirty in the eastern circuit courts and twenty-four in the northern circuit courts. In addition to the pressure of work to be done during the weeks on circuit, the judges had to deal with a massive load of work at the seats of the different courts: during the period 1891 to 1893, in the Supreme Court, Eastern Districts Court and the Griqualand High Court there was a total number of 478 defended civil trials, 413 undefended civil causes, 566 provisional cases, 3 965 motions, 181 appeals and no less than 9 868 reviews of criminal cases tried in the magistrates' courts. The number of cases is indicative of the unremitting hard work done on circuit. The large number of civil cases tried on circuit is no doubt also indicative of a society that trusted its courts for the fair resolution of disputes. In an arid country, water is a precious commodity. From the earliest days of colonial settlement at the Cape, there were frequent disputes about water rights.162 Innes remembers a circuit at Oudtshoorn, a rich agricultural district, when the contested civil cases (all about servitudes and water rights) outnumbered those at Cape Town during the preceding term.163 Principles underlying the then nascent water law of South Africa were often first enunciated in judgments given on circuit. Thus the principles governing the fundamental distinction between private water and public streams, which underlay the whole of South African water law until the repeal of the Water Act 54 of 1956 by the National Water Act 36 of 1998, derive from two leading cases originally decided on circuit; viz Vermaak v Palmer,164 which was heard by Judge Smith at Uitenhage on 4 May 1875 (the judgment was handed down in Grahamstown on 31 August 1875),165 and Van Heerden v Wiese,166 which was decided by Judge Dwyer at Victoria West on 8 April 1880.167 In both cases, an appeal against the circuit judge's decision was dismissed. The circuits afforded the members of the Bar, in the words of Innes, "an invaluable experience of corporate social life".169 It was not only a matter of jovial conviviality: in 1878 rules were adopted which for many years, deep into the twentieth century, governed arrangements and professional conduct on circuit. In this way, the circuits played an important role in forging the unity and the strength of the Bar as a profession. After a good day's work comes a good night's fun. A dinner, a game of whist, a dance, association with the beauty and good-fellowship of our country friends, renovate one for the next day's work. And heartiness of Circuit amusement is the essence of its enjoyment. You feel your welcome is warm and meant: and you would be a great goose, indeed, not to reciprocate such genuine kindness by making yourself thoroughly at home, enjoying yourself accordingly. At some venues there were sporting events: shooting, racing and cricket. An important event in the social calendar was the judge's dinner to which members of the Bar and local dignitaries were invited. The authors of reminiscences are unanimous in their praise of the hospitality of the farmers along the way from whom the judges and counsel on circuit were sometimes obliged to seek overnight accommodation. The social activity and social contacts and interaction on circuit should not be underestimated as a major contributing factor to the integration of the courts and the administration of justice into the social fabric and social conscience of the outlying communities. The circuit courts established in 1811 constitute an important precursor to the Charters of Justice of 1827 and 1832 by which the fundamental features characteristic of proceedings at common law were introduced at the Cape. They also paved the way for the circuit courts established in 1827 under the First Charter of Justice, the predecessors of the circuit courts which to this day form part of the legal landscape in South Africa. The new procedural and judicial style was carried into the country districts by the regular visits of judges on circuit. The judges performed their task under extremely difficult and often hazardous conditions. They stuck to their task with commendable tenacity and perseverance. As the years went by the roads, the means of transport and the accommodation improved but the physical hardship of "circuit riding" was never completely eliminated. The achievement of the Cape judges in the development of South African law, and their vital contribution to the survival of the Roman-Dutch law,175 seem even more remarkable and praiseworthy if one considers that each one of them, for nine weeks or more of each year, endured the hardship and hazards of the circuits. The circuit courts brought the highest level administration of justice to the outlying districts. The fact that the sittings of the courts were open to the public, and the fact that the community participated in the proceedings by way of jury service, contributed to the integration of the administration of justice into the social fabric and "judicial conscience" of the people in the outlying communities. The circuit courts played a major role in entrenching the English procedural and judicial style within the minds of the people. Adjective law thus in large measure departed from Roman-Dutch principles and followed the principles of English law as adopted in the Cape under British rule. Even where - as with landdrosten and heemraden - institutions had a veneer of the old Cape under the Company, the substance beneath would be found predominantly English. Finally, from the outset, from the first circuits in 1811, the message was brought home that the courts were open to all the people of the colony, and that the protection of the courts extended to all of them. This message was again emphasised by Chief Justice De Villiers in 1868 in the defamation suit which sprang from the circuit-court sitting at Victoria West. It may be an ideal which was not always realised in practice, but an ideal and governing principle it remained. * I owe a debt of gratitude to a number of people for their interest and assistance: to Ms M Seyffert of the Africana Collection in the JS Gericke Library of Stellenbosch University and Ms E de Wet of the Cory Library for Historical Research at Rhodes University, Grahamstown; to the Cape Bar Council for making available valuable photographs from their collection in the Cape Bar Library; to Jeremy Gauntlett SC for facilitating the loan of the photographs; and to Prof Jacques du Plessis of Stellenbosch University who arranged for the scanning and re-framing of the photographs. 1 In South Africa, lower (magistrates') courts may also sit at venues other than the seat of the magistracy. Section 2 of the Magistrates' Courts Act 32 of 1944 makes provision for periodical courts which may be held at a venue away from the seat of the district court. In Australia, legislation to rename the Federal Magistrates' Court the "Federal Circuit Court of Australia" and to change the title of Federal Magistrate to Judge was passed in Nov 2012 available at http://pandora.nla.gov.au/pan/132822/20130204-0704/ http://www.attorneygeneral.gov.au/Media-releases/Pages/2012/Fourth%20Quarter/21November2012 FederalCircuitCourtofAustraliaestablishedinlaw.html (accessed 26 Nov 2012). 2 Josua Glick "Comment: On the road. The Supreme Court and the history of circuit riding" (2003) 24 CardozoLR 1753-1843. 3 The twelve United States Courts of Appeal are traditionally known as "circuit courts". Each of the Courts of Appeal covers its own individual circuit. For example, the United States Court of Appeal for the Eleventh Circuit deals with cases from the states of Alabama, Florida and Georgia. Most of the cases of the Eleventh Circuit are heard at the Court's principal seat in Atlanta, Georgia. However, in keeping with the tradition of the circuit court system, the Eleventh Circuit occasionally hears cases in Jacksonville and Miami, Florida, and Montgomery, Alabama (http://www.catea.gatech.edu/grade/legal/circuits.html (accessed 26 Nov 2012)). 4 See GG Visagie Regspleging en Reg aan die Kaap van 1652 tot 1806 (Cape Town, 1969) at 40ff. 6 Theal (n 5) vol 3 at 481. 7 Idem vol 4 at 117. 8 KAB VC 100 at 16-17 (reference is to the Cape Town Archives Repository, followed by the relevant document series and the page number); see Visagie (n 4) at 93-94. 10 Proclamations, Advertisements, and Other Official Notices Published by the Government of the Cape of Good Hope from 10th January 1806 to 2nd May 1825 (Cape of Good Hope, 1827) (hereafter Proclamations, Advertisements, and Other Official Notices) at 153ff. The Proclamation is reproduced in part in GW Eybers Select Constitutional Documents Illustrating South African History 17951910 (London, 1918) doc 67 at 103-104, only two of the seventy-one regulations appended to the Proclamation being reproduced. 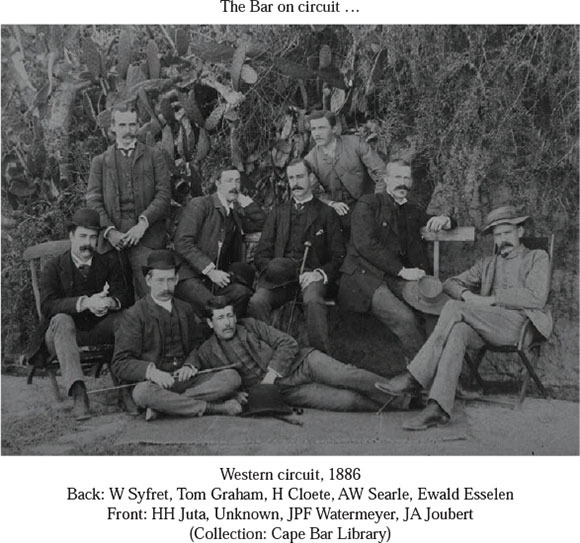 11 Thus in History Online available at http://www.sahistory.org.za/dated-event/judges-black-circuit-return-cape-town (accessed 12 Nov 2012), mention is made of "the circuit court (Black Circuit) instituted by Cape Governor John Cradock to investigate serious charges brought by Dr JT van der Kemp and James Read ... in connection with murder and maltreatment of Hottentots (Khoikoi) by Whites". 12 The report dated 6 Sep 1826 is reproduced in Theal (n 5) vol 28 at 1-111. The observation referred to appears at 8-9. 14 Fryer (n 9) at 92-93; Giliomee (n 13) at 310. 15 These aims are spelled out in the preamble to the Proclamation. 16 This was provided for in reg 62 of the regulations appended to the Proclamation. The effect of the regulation is discussed below. 17 This was provided for in regs 63, 64 and 65 which provide as follows: 63. It is particularly incumbent upon the Commission that they, in their judicial capacity, take care that the Proclamation of the 1st Nov. 1809, respecting the treatment of Hottentots, be strictly followed up; and that, as much as possible, regularity respecting the service of those natives, as well proper treatment of them, be punctually observed. 64. The Commission is enjoined scrupulously to examine the records of punishments afflicted on Slaves by order of the Landdrost, in order to ascertain that no unnecessary severity be practised upon the unfortunate class of People. 65. The Commission shall likewise, as far as lies in their power, ascertain that no improper domestic correction has been used by Masters towards their Slaves, without the same being brought forward for legal interferences. 19 In the Romano-Canonical procedural model which applied at the Cape before 1827, the evidence was gathered by an official who prepared a written report which he submitted to the judicial officer seized of the matter. On the Romano-Canonical procedural model which applied at the Cape, see Jerold Taitz "A further tribute to the Charter of Justice" (1979) 96 SALJ 470-475; GG Visagie et al Die Kaapse Regspraak-Projek Die Siviele Appèlhof en die Raad van Justisie, Hofstukke en Uitsprake wat betrekking het op Siviele Sake 1806-1827 (Cape Town,1989), also published in Koster-Van Dijk & Wijffels (eds) Miscellanea Forensia Historica ter gelegenheid van het afscheid van Prof Mr J Th de Smidt (Amsterdam, 1988) 325ff; HJ Erasmus "The interaction of substantive law and procedure" in Zimmermann & Visser (eds) Southern Cross. Civil Law and Common Law in South Africa (New York, 1996) 141-161 at 143-145 and the references given there. 20 Reg 27: In both cases mentioned in the three preceding Articles, the Commission is to commence the Trial on the prosecution of the landdrost; hear first the Witnesses each separately, then the accused as well as the Witnesses called by him; confront the accused with the Witnesses; and then, after having fully investigated all the circumstances, as far as the nature of the case will allow, declare, "that the Examination is closed". Reg 32: But in case the accused does not confess the crime, the claim and conclusions are to be read to him in like manner, and every argument with which the Landdrost endeavours to prove the commission of the crime, distinctly explained to the Prisoner, whose reasons against the same shall be heard, and carefully noted down; upon which the Landdrost and the Prisoner being heard in reply and rejoinder, the Trial is to be considered as closed, and Sentence passed by the Commission according to law. In these cases, the Sentence may be appealed from. 21 Reg 40: The Witnesses are to be heard in person before the Commission, and their depositions, as well as the rehearing of them, and the affirmation by oath, to be recorded in the minutes of the proceedings of the Commission. 22 For a detailed analysis of the reports, see Fryer (n 9) ch 8 at 166-193. 23 C Graham Botha "The early influence of the English law upon the Roman-Dutch law in South Africa" (1923) 40 SALJ 304-406 at 398. 24 Proclamations, Advertisements, and Other Official Notices (n 10) at 259. The Proclamation is reproduced in part in Eybers (n 10) doc 68 at 105. 25 Correspondence of Cradock and Truter on the Proclamation in Theal (n 5) vol 9 at 219, 236. See, further, WP Schutz "Open doors" (1993) 110 SALJ597-598. 26 Ord 68 of 19 Dec 1827 (Cape), in Eybers (n 10) doc 73 at 109. 27 Fryer (n 9) at 144-146. 29 Cory (n 28) at 217-218. 31 Cory (n 28) at 206. 32 De Kiewiet (n 30) at 46. 33 The report dated 6 Sep 1826 is reproduced in Theal (n 5) vol 28 at 1-111. 36 Botha (n 23) at 396-406. 37 Theal (n 5) vol 14 at 183ff. 38 The commissioners were John Thomas Bigge, a former Chief Justice of Trinidad, and Major WMG Colebrooke. See, further, PJ Van der Merwe Regsinstellings en Reg aan die Kaap van 1806 tot 1834 (LLD, University of the Western Cape, 1984) at 239ff. 39 Theal (n 5) vol 17 at 333ff; vol 28 at 1ff. 40 See Taitz (n 19) at 470; Van der Merwe (n 38) at 287ff. 42 Repealed by the Criminal Procedure and Evidence Act, 31 of 1917; text of repealed part in Theal (n 5) vol 32 at 284. 43 The remainder of this section was abrogated by s 13 of Act 5 of 1879 (Cape). 47 Theal (n 5) vol 32 at 254-273. 49 See Fine (n 35) at 68-72; AF Hattersley "Early days of judicial circuits in South Africa" (1958/59) 13 Africana Notes and News 122-131. 50 The Proclamation is contained in the Government Gazette of 29 Feb 1828. The lengthy and wordy Proclamation took a form which was retained, with but minor changes, in all subsequent Proclamations throughout the period covered by this study. 51 Hattersley (n 49) at 124. 53 These financial arrangements were an improvement on the original plan which provided the judges with an official claim on the hospitality of the inhabitants whose houses were situated on the circuit routes. The new arrangement elicited favourable comment in 20 Mar 1828 The Colonist (cited by Fine (n 35) at 69). 54 Hattersley (n 49) at 124. 55 See Fine (n 35) at 69-71.Thus his opening remarks at Uitenhage were extensively reported in The Colonist of 20 May 1828. In Grahamstown he received an address from the Dutch inhabitants of Albany who expressed great pleasure at the introduction of British forms of justice, and in particular the establishment of juries (1 Jul 1828 The Colonist). At Graaff-Reinet he was met by local officials and a party of horsemen who greeted him with cheers and a discharge of firearms (26 Jul 1828 The Colonist). 56 26 Jul 1828 The Colonist; and see Fine (n 35) at 70-71. 57 Additional circuits only came into being upon the establishment in 1864 of the Eastern Districts Court with its seat at Grahamstown, when a separate eastern circuit was introduced, and the establishment in 1882 of the High Court of Griqualand with its seat at Kimberley, when a northern circuit was introduced. 58 Theal (n 5) vol 32 at 254-273. 59 GG of 4 Sep 1829 (Cape). 60 Observations on some Parts of the Judicial System and Civil Establishment of the Colony of the Cape of Good Hope KAB CO 372, cited by Fine (n 35) at 189-190. 61 The letter appears in FG Richings "The early South African circuits: An early letter" (1973) 90 SALJ 419-422 at 421-422. 62 "Hartebeest" was probably a pet name Judge Burton gave his own wagon. There is no mention of a coach, carriage or wagon with the general name "hartebeest" in H Van der Merwe Die Tradisionele Wamakersbedryfin Suid-Afrika met Spesifieke Verwysing na diePaarl (MA, University of Stellenbosch, 1983) nor in J Malan Rytuie van Weleer 'n Monografie van die Nasionale Kultuurhistoriese Museum (Pretoria, 1981). 63 Fine (n 35) at 190. 64 Report from the Committee of the Legislative Council on the Judicial Establishment 1845 (KAB CO 372). 65 Fine (n 35) at 191. The system was abolished by notice in the GG of 3 Jun 1847 (Cape). 66 Cape of Good Hope Official Publications, 1854-1910 (Cape Town, 1854-1910) (hereafter Official Publications) A2-1854. 67 Official Publications (n 66) G45-1859. 68 Letter dated 8 Feb 1864 published in Official Publications (n 66) A4-1864. 69 On the death of Judge Menzies, see C Graham Botha "The Honourable William Menzies 1795-1850" (1916) 33 SALJ 385-404 at 402-403. 70 The death of Judge Musgrave on 6 Oct 1854 as a result of fatigue and exposure during the course is dealt with in the South African Commercial Advertiser of 7 Oct 1854. 71 AF Hattersley A Victorian Lady at the Cape (Cape Town, 1950) at 52. 72 Paul Johnson The Birth of the Modern World Society 1815-1830 (London, 1991) at 170. 73 Victor Sampson My Reminiscences (London, 1926) at 74. 74 AW Cole "Reminiscences of the Cape Bar and Cape Bench" (1888) 5 Cape LJ 1-12 at 7. He tells the story in greater detail in his Reminiscences of my Life and of The Cape Bench and Bar (Cape Town, 1896) (hereafter Cole Reminiscences of my Life) at 21-22. 75 George Randell Bench and Bar of the Eastern Cape (Grahamstown, sd) "History of the Eastern Cape Provincial Division" at 7; Sampson (n 73) at 73. 76 Official Publications (n 66) A15-1865. Calvinia was granted its circuit court in 1869. 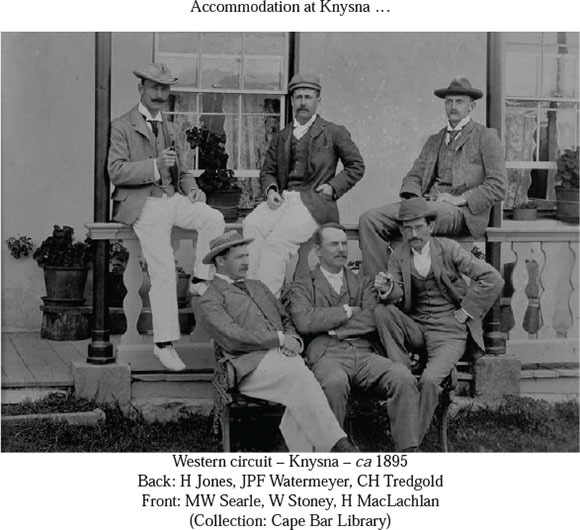 In 1871 the inhabitants of Clanwilliam petitioned for the restoration of the circuit court at Clanwilliam, which had been removed in 1869 "without any sufficient cause or reason". 77 For a contemporary account, see Anon "Colonial roads, routes, and modes of travel. A sketch for home eaders" in (Jan-Jun 1874) 8 Cape Monthly Magazine (New Series) 289-300. 78 In the William Fehr Collection, Rust and Vreugd, Cape Town. A copy of the sketch appears in Graham Ross The Romance of Cape Mountain Passes (Cape Town, 2002) at 65. 79 On Montagu's road building programme, see JJ Breitenbach The Development of the Secretaryship to the Government at the Cape of Good Hope under John Montagu 1845-1852 in Archives Year Book for South African History vol 22(2) (Pretoria, 1959) 231-249. 80 Jose Burman Early Railways at the Cape (Cape Town, 1984) at 14. 81 On the Cape cart, see Malan (n 62) at 115. 82 On the Phaeton family of carriages, see Malan (n 62) at 104ff. Hattersley (n 71) at 52 refers to the improved comfort which the American spider afforded the judges on circuit. 83 Perceval Maitland Laurence Collectanea. Essays, Addresses and Reviews (Cape Town, 1899) "On circuit at the Cape" 290-304 at 294. James Rose Innes says that "we always engaged our carts from Hadjie Jatiem" who was "a good whip and a consumate horse master": James Rose Innes Chief Justice of South Africa 1914-1927 Autobiography with an introduction by BA Tindall (Cape Town, 1949) at 39. The contractors used the so-called "vastekapkar" or Malay cart which was drawn by four to six horses and which was frequently used for the conveyance of passengers with baggage. See Malan (n 62) at 117-118. 84 Rose Innes (n 83) at 38-39. 85 The published reminiscences all date from the last quarter of the nineteenth century. Not one of the authors had first-hand experience of conditions on circuit before the improvement of the roads in the late 1840s and afterwards. A light-hearted account of life on circuit which pre-dates all published reminiscences appeared under the heading "Off on circuit" in (Jul-Dec 1870) 1 Cape Monthly Magazine (New Series) at 49-55, 372-378. 86 Henry Juta Reminiscences of the Western Circuit (Cape Town, 1912) at 8 remembers carts "smothered in dust". 87 Cole Reminiscences of my Life (n 74) at 38, 47-51. Juta (n 86) at 166 recalls a harrowing journey across the Swartberg Pass in a heavy snowstorm. 88 Cole Reminiscences of my Life (n 74) at 22, 47-51; John Kotze Biographical Memoirs and Reminiscences vol 1 (Cape Town, 1934) at 180-181. As a result of flooded rivers, it once took Bishop Gray, accompanied by his indomitable wife Sophie, thirteen hours to complete the sixty-five kilometre journey from Belvidere (near Knysna) to George: Thelma Gutsche The Bishop's Lady (Cape Town, 1970) at 104-105. 89 As a student he obtained a first in the Classical Tripos at Cambridge. 90 (n 83) at 293. 91 Kotze (n 88) at 180-181. 93 Perceval M Laurence On Circuit in Kafirland and other Sketches and Studies (London, 1903) "On circuit in Kafirland" at 2-3. In his evidence before the select committee appointed to consider and report on the petition of the inhabitants of Fort Beaufort for the establishment of a circuit court, a witness in answer to a question as to the distance from Murraysburg to Graaff-Reinet said "Ten hours". He described the distance from Colesburg to Middelburg as "about ten hours", and the distance from Middelburg to Graaff-Reinet as "twelve hours" (Official Publications (n 66) A3-1870). 94 Official Publications (n 66) A8-1867. 95 Randell (n 75) "Requiem for the Transkei Circuit" at 108. 96 GG of 31 Dec 1858 (Cape). 97 The whole process is considered in detail by Fine (n 35) at 194-202. 98 Act 21 of 1864 (Cape). 99 GN 42 GG of 7 Feb 1865 (Cape); GN 72 GG of 7 Mar 1865 (Cape). 100 GN 47 GG of 10 Feb 1865 (Cape). 101 See, generally, Burman (n 80); and DH Heydenrych Die Geskiedenis van die Spoorweë in die Kaapkolonie tot 1885 (MA, Stellenbosch University, 1965). 102 Burman (n 80) at 61. 103 Innes (n 83) at 47. 104 Kotze (n 88) at 432-435. 105 EA Walker Lord De Villers and his Times. South Africa 1841-1914 (London, 1924) at 273. 106 Cole Reminiscences of my Life (n 74) at 22. 107 Sampson (n 73) at 82. Juta (n 86) at 150 commends Rankin's at the entrance to the Meiringspoort, and Ben's at George. As early as 1829, Judge Burton, as we have seen, expressed his satisfaction with the hotel at Grahamstown. 108 See Randell (n 75) at 111. See, also, Hattersley (n 49) at 125 for advertisements for lodgings in George. 109 Hattersley (n 49) at 125. 110 That is degrees fahrenheit, about 38 degrees centigrade. 111 Letter dated 12 Jan 1859: Official Publications (n 66) G45-59. 112 Sampson (n 73) at 82. The court houses in Natal were as bad; see P Spiller A History of the District and Supreme Court of Natal 1846-1910 (Durban, 1986) at 13-15. 113 Randell (n 75) at 2-4. 114 Perhaps the best known incursion is that led by General JC Smuts - the story is told by Deneys Reitz in his classic Commando A Boer Journal of the Boer War (London, 1929). 115 In the Government Gazettes of 4 and 8 Jan 1901 martial law was extended to the districts of Fraserburg, Worcester, Sutherland, Prince Albert, Ceres, Calvinia, Clanwilliam, Piquetberg, Malmesbury, Tulbagh, Paarl and Stellenbosch. 116 Laurence (n 93) at 2-3 describes the interruption of communications. 117 Idem at 29-40: "How we went circuit in 'a sort of war' ". 118 For a copy of such a pass, see Laurence (n 93) at 38. 119 The details of the dispute are considered by Fine (n 35) at 81-86. The erroneous view propounded by F St L Searle "Honourable Sir WW Burton" (1935) 52 SALJ 257-262 at 259, that Judges Burton and Menzies believed that a person who did not understand English was not qualified to sit as a juror, while Chief Justice Wylde and Judge Kekewich believed the opposite, is followed by Stephen D Girvin, both in his PhD thesis (The Influence of a British Legal Education and Practice at the Bar on the Judges appointed to the Supreme Courts of Southern Africa, 1827-1910 (University of Aberdeen, 1990) at 164) and in his article "The establishment of the Supreme Court of the Cape of Good Hope and its history under the Chief Justiceship of Sir John Wylde" (1992) 109 SALJ 652-665 at 653. Ellison Kahn in turn follows Girvin in "Restore the jury? Or reform? Reform? Aren't things bad enough already" (1991) 108 SALJ 672-687 at 681. It was in fact, as Fine points out, Chief Justice Wylde and Judge Menzies who contended that knowledge of English was essential, while Judges Burton and Kekewich considered that it was not. Fine's view is shared by Hattersley (n 49) at 124-125. 120 Cole Reminiscences of my Life (n 74) at 101. 121 Idem at 8 (and see 102) describes JCB Serrurier, who was an interpreter in the Supreme Court in Cape Town, as "excellent". The virtues of the Rev DP Faure, who was a circuit interpreter from 1872 to 1880, are extolled by Innes (n 83) at 44. 122 In his letter of 1 Nov 1829 to Judge Menzies (see n 61 supra). Judge Burton found that while some interpreters were able to convey the judge's charge to the jury, they were quite incompetent when it came to the examination of witnesses. 123 Juta (n 86) at 113-130. 124 See JC Kannemeyer Langenhoven. n Lewe (Kaapstad, 1995) at 210, 225. 125 Cole Reminiscences of my Life (n 74) at 102. 126 Anon "Trial by jury" (1885) 2 Cape LJ121-124 at 124. 127 Juta (n 86) at 80 supports this view. 128 Official Publications (n 66) C15-1859. 130 See n 76 supra. 131 Judge Burton in his letter of 1 Nov 1829 to Judge Menzies (n 61 supra). 132 Laurence (n 83) at 300-301; Juta (n 86) at 80 has similar views about the juries that "do their work very well on the whole". 133 Laurence (n 83) at 301. 134 Kahn (n 119) at 687 points out that "after a couple of circuits blacks ceased to be on the panel of jurors". 135 Sampson (n 73) at 72-73. 136 Cited by Walker (n 105) at 142. The liberal attitude of the judges does not seem to have prevailed: jury membership in due course became the almost exclusive preserve of white males. On the history and function of the jury in South Africa, see Kahn (n 119) at 679-687, and in (1992) 109 SAL/87-111. 137 Kotze (n 88) at 206-207. 138 Cited by Walker (n 105) at 142. 139 Teresa Strauss The War Along the Orange. The Korana and the Northern Border Wars of 1868-9 and 1878-9 (Cape Town, 1979) at 109. 140 Innes (n 83) at 41. 141 Text of the telegram from Jones to Upington, cited by De Villiers CJ in his judgment in Upington v Solomon & Co; Upington v Dormer (1879) 9 Buch 240 at 279. 142 Innes (n 83) at 42. 143 Upington v Solomon & Co; Upington v Dormer (n 141). 144 Innes (n 83) at 43. 145 Nigel Penn The Forgotten Frontier. Colonist and Khoisan on the Cape's Northern Frontier in the 18th Century (Cape Town, 2005) at 286. 146 Robert Ross "The !Kora wars on the Orange River, 1830-1880" (1975) 26(4) J of African History 561-576; Strauss (n 139) passim. 147 The word "Bastaard" was used to refer to those born of miscegenous relationships. In the Cape colonial context there were three major instances of miscegenation: whites with slaves; whites with Khoikoi, and slaves with Khoikoi - the offspring of the latter were known as "Bastaard-Hottentots". During the eighteenth century both "Bastaard" and "Bastaard-Hottentots" suffered increasing discrimination. Many of them left the colony and settled on the northern border on the Orange River where they were to play an important part in later years. See Penn (n 145) at 20-21. 148 Strauss (n 139) at v. This view was shared by Theal (n 5) vol 4 at 31-32 who referred to the Korana as "ragamuffin vagabonds who refused to submit to the restraints of law and order and set the colonial government at defiance". 149 Cited by WEG Solomon Saul Solomon. The Member for Cape Town (Cape Town, 1948) at 331. 150 Despite praise for his action from Chief Justice De Villiers, the Rev Faure was deprived of his post, and of his livelihood, on the ground that as a civil servant he had not been entitled to write his letter. Innes (n 83) at 44 said that Faure emerged from his ordeal, "crippled in means but with flying colours". 151 Upington v Solomon & Co; Upington v Dormer (n 141) at 279. 152 Correspondence ensued between the colonial secretary and Judge Dwyer concerning allegations that in writing the letter, the judge had acted improperly and thereby disqualified himself from the discharge of the duties of his high office. In the end, no further action was taken but Judge Dwyer was severely censured by the colonial secretary who expressed the hope in a letter to him "that you will be more guarded in future" (Correspondence between the Honourable the Colonial Secretary and the Honourable Mr Justice Dwyer relative to a letter dated Oct 1879, addressed to Mr Saul Solomon in Official Publications (n 66) A5-1880). 153 Upington v Solomon & Co; Upington v Dormer (n 141) at 270. 154 See Menzies' letter cited supra in the text to n 60; Sampson (n 73) at 65; Randell (n 75) at 6. Burton J preferred to start at 7 o'clock in the morning (in his letter referred to in n 61 supra). 155 Fine (n 35) app 6 at 221. 156 Idem app 7 at 222. 157 Official Publications (n 66) A15-1867. 160 The judgment on appeal is reported as Divisional Council, Port Elizabeth v Divisional Council, Uitenhage (1868) 1 Buch 40. 161 Juta (n 86) at 157. 162 See CG Hall The Origins and Development of Water Rights in South Africa (LLD, Stellenbosch University 1935). 163 Innes (n 83) at 40. 164 (1876) 6 Buch 25. CG Hall assisted by AP Burger Water Rights in South Africa (Cape Town, 1974) at 47 says that the doctrine laid down in Vermaak v Palmer "has become an established principle of our law". 165 The judgment of Smith J is reported (at 28-31) along with the judgment given on appeal by de Villiers CJ. 166 (1880-1884) 1 Buch AC 5 of this case, Hall (n 164) at 21 says that the "clear statement of the common law has been generally accepted and it has never been departed from in the courts, nor altered by legislation". 167 Other decisions on the use of private water were Nel v Potgieter (1881) 1 Buch AC 22 in which a decision by De Villiers CJ given on circuit at Oudtshoorn was upheld on appeal, and Erasmus v De Wet (1867) 4 Buch 204 which was heard at Robertson in 1866 by Watermeyer J (there was no appeal against this judgment). 168 Innes (n 83) at 46. Juta (n 86) at 7 fondly remembers the early circuits as events "full of pleasant anticipation". The conviviality and companionship on circuit is also apparent from "Off on circuit" (n 85) at 49-55, 372-378. 169 Innes (n 83) at 38. 170 "Off on circuit" (n 85) at 49-50, 54. 172 Erasmus (n 19) and the references there given. 173 DE Van Loggerenberg Hofbeheer en Partybeheer in die Burgerlike Litigasieproses 'n Regshervormingsondersoek (LLD, University of Port Elizabeth, 1987). 174 Erasmus (n 19) and the references there given, to which may be added Fine (n 35). 175 See Rena Van den Bergh "The remarkable survival of Roman-Dutch law in nineteenth century South Africa" (2012) 18(1) Fundamina 71-90. 177 See A Wijpkema De Invloed van Nederland op Ontstaan en Ontwikkeling van de Staatsinstellingen der ZA Republiek tot 1881 (Pretoria, 1939). 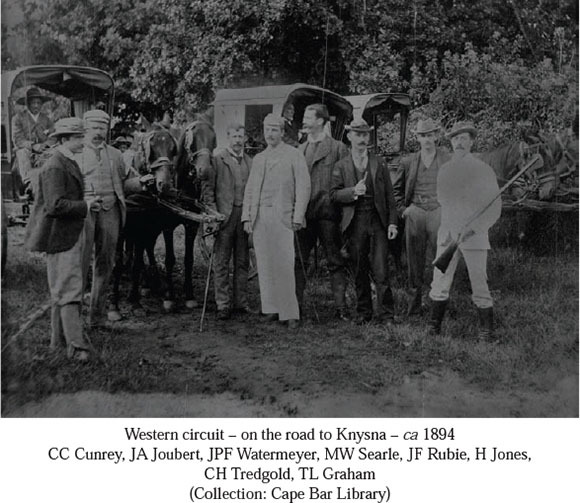 178 In his Biographical Memoirs and Reminiscences (n 88) vol 1 at 458-488, Chief Justice Kotzé describes a long circuit through the Transvaal in 1877 which took the same form as the circuits in the Cape. Rider Haggard (later Sir), who was to become a famous author, was Kotzé's registrar. Early circuits in Natal are referred to by Hattersley (n 49) at 128-131. 179 On the administration ofjustice in the ZAR, see JGK "The administration ofjustice in the South African Republic (Transvaal)" (1919) 36 SALJ 128-139; Ellison Kahn "The history of the administration of justice in the South African Republic" (1958) 75 SALJ 294-317; (1958) 75 SALJ 397-417 at 397; and (1959) 76 SALJ 46-57 at 46. 180 Ord 5 of 1864 (ZAR). 181 Ord 40 of 1828 (Cape); Ords 72 and 73 of 1830 (Cape). 182 Law 1 of 1874 (ZAR). 183 A Wijpkema Die Invloed van Nederland en Nederlands-Indië op Ontstaan en Ontwikkeling van die Regswese in Suid-Afrika tot 1881 (Amsterdam, 1934) at 188. 184 By Ord 3 of 1856 (OFS) and rules framed thereunder by the Executive Council on 31 May 1856 (criminal procedure in superior courts); 20 Feb 1858 (civil procedure in superior courts); 27 Sep 1856 (procedure in inferior courts) - see HR Hahlo & Ellison Kahn The Union of South Africa The Development of its Laws and Constitution (Cape Town, 1960) at 244 and esp n 78. 185 Ord 7 of 1976 (OFS). 186 Ord 6 of 1856 (OFS). 187 roc 16 of 1902 (T). 188 See Wessels (n 41) at 395; David T Zeffertt, A Paizes & A St Q Skeen The South African Law of Evidence (formerly Hoffmann and Zeffertt) (Durban, 2003) at 7. 189 Hahlo & Kahn (n 184) at 244-245. These words, which Hahlo & Kahn use with reference to the Orange Free State, apply with equal force to the situation in the Transvaal. 190 Wijpkema (n 183) at 199.